CD15 plays a role in mediating phagocytosis, bactericidal activity, and chemotaxis. CD15 plays a role in mediating phagocytosis, bactericidal activity, and chemotaxis. It is present on >95% of granulocytes including neutrophils and eosinophils and to a lesser degree on monocytes. In addition, CD15 is expressed in Reed-Sternberg cells and some epithelial cells. 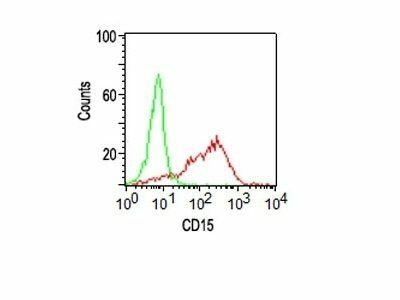 CD15 antibody is very useful in the identification of Hodgkin’s disease. 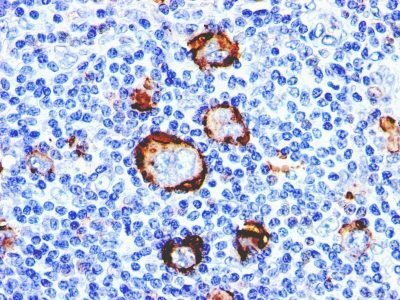 CD15 is occasionally expressed in large cell lymphomas of both B and T phenotypes which otherwise have a quite distinct histological appearance. Catalog number key for antibody number 0277, Anti-CD15 (Leu-M1) The prefix indicates conjugation, followed by the antibody number and size suffix.